If you plan to use Print-On-Demand (POD) for your printing (such as KDP or IngramSpark), there is no need to worry about warehousing, fulfillment or distribution and thus no need to use Amazon Advantage. However, if you plan on printing your books using a short-run printer or an offset press (I highly recommend Total Printing Systems–not an affiliate, just a fan), you are going to have to consider storing your books in your garage, extra room or a storage facility. How will customers be able to purchase these books, get them fulfilled and shipped to them? The solution is to use Amazon Advantage. In a nutshell, you will want to store your books in Amazon’s warehouse, list your book on their site, and allow Amazon to take orders and ship your book to the customer while handling any returns & dealing with customer service. Eric Van Der Hope is one of the most helpful experts I’ve ever met in the self-publishing industry. He’s so helpful, in fact, that when I asked him for some insight on the process, he just went ahead and wrote a whole article about it for me to post on my site. Eric has several great articles on his website, including How to Set-Up Pre-Orders on Amazon (for Print Books). But save yourself the time and just hire him to manage it for you. Money well spent! 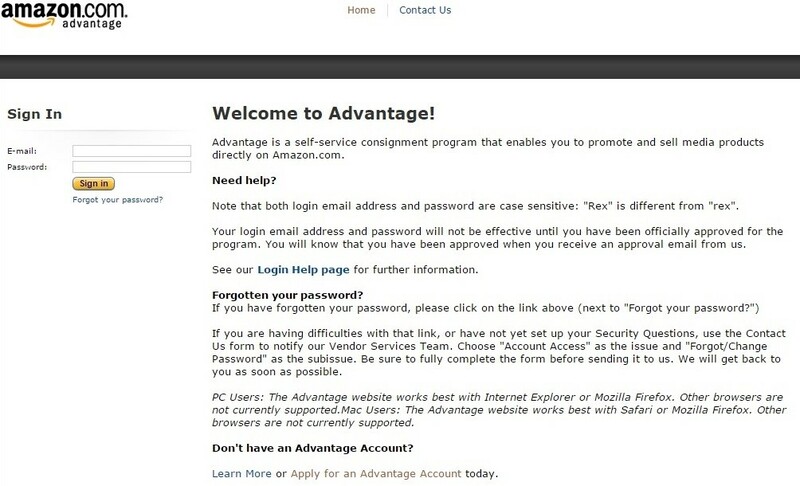 What is the Amazon Advantage Program? The Advantage program offers a proven means of distribution and order fulfillment for media products (such as books, videos, and music). This program is NOT intended for individuals selling used copies, or resellers of books (such as bookstores or retailers). If that is your interest, you should review Amazon’s other selling options, such as Selling on Amazon and Fulfillment by Amazon. Once you’ve decided that Amazon Advantage is what you’d like to use to facilitate storage of your book and help with fulfillment through Amazon, you’ll need to know what is required before getting set up. Access to internet and email. A US Bank Account (for electronic funds transfers). Have North American distribution rights to any book/title you enroll. Front Book Cover (and preferably the Back Book cover), as a jpg. Copy for your Amazon Listing (Metadata such as title of book, author name, publish date, description of book, author bio, etc.). Physical copies of the book with a scannable barcode on its backcover which maps to the valid ISBN. You can get started by submitting an online application to set up your own account (in your name or in your business name). You’ll end up having to accept a few T&C’s and provide contact information. Use up-to-date email address and contact name. You’ll also be asked to choose a payment method. The cost of maintaining your account is $99.00 per year (the cost is not an up-front cost but Amazon will “assess and automatically debit this fee from your account each year in May; if you establish a new membership after the beginning of the account year, we will prorate the fee and automatically debit it from the first funds payable to your account”). 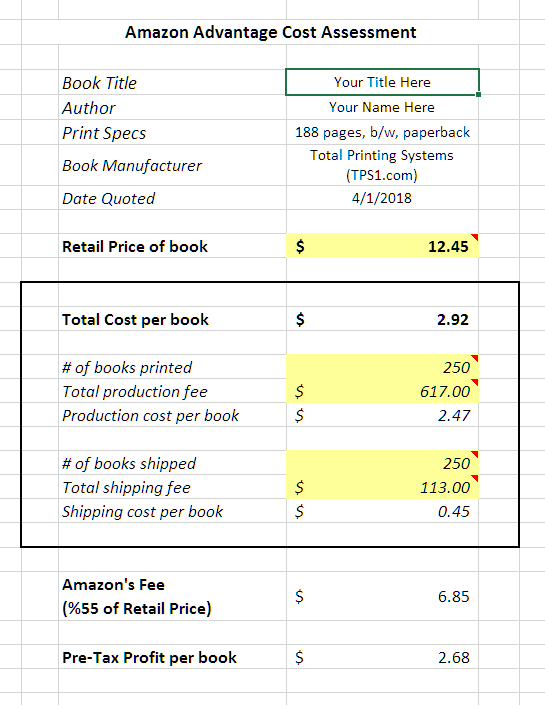 The annual fee is the cost for storing your books in Amazon’s warehouses and include fulfillment and customer service. There are no monthly costs. If all information has been filled out correctly, Amazon usually approves the account instantly. If you notice a slightly different Amazon Advantage interface, you’ve been approved as a new Amazon Vendor. In the top menu bar, highlight ‘Items’ and a dropdown menu will appear. Click on ‘Add an Item’. Choose Book for Product Type. Insert your ISBN (without hyphens). Click on the gold ‘Next’ button. Follow the rest of the prompts. After you’ve completed filling in all necessary information, click on the gold ‘Preview results’ button. If to your liking hit Submit. If not, go back and make changes and review again, then submit. Congrats … you’ve successfully added the book to your account! After you’ve completed this part of the process, you’ll be able to upload images of your book immediately. 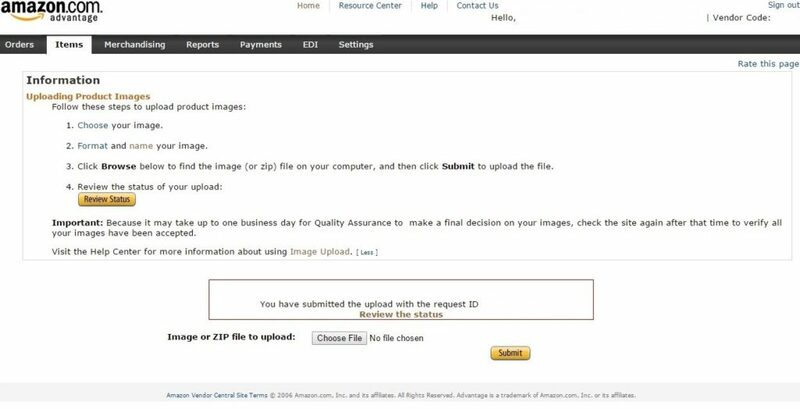 Click on the grey ‘Choose File’ button to find your cover (prior to that make sure you are using the correct naming convention and format for the image using Amazon’s guidelines). Click on the gold ‘Submit’ button. Once Amazon verifies the image/s, your pre-order page will be updated once it goes ‘LIVE’. It’s ‘normal’ for an Amazon Book Listing to appear (go ‘LIVE‘) within a 24-48 hour period. However, I’ve noticed that books I’ve setup in the past sometimes go ‘LIVE‘ within 3 hours! That’s it, you’ve set up your book so that Amazon can add it to their database. Now they will move forward on creating your Amazon Book Listing. So how will you know when your book is ‘LIVE‘? Does Amazon contact you to let you know? Fortunately, there is an easy way to find out. It’s what I describe as: your Authentic Amazon Book url. 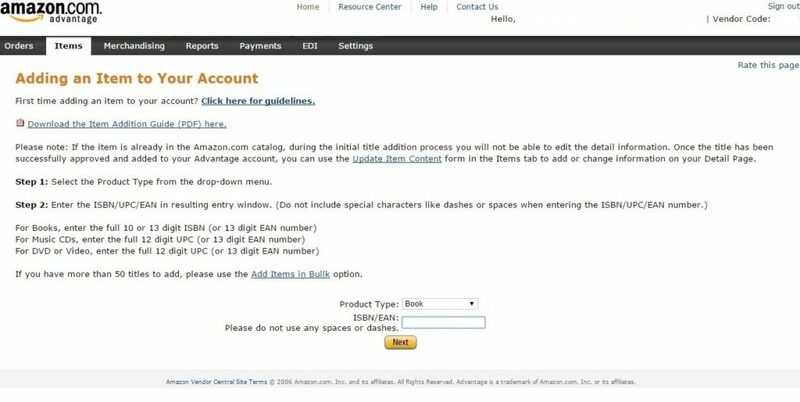 http://amazon.com/dp/xxxxxxxxxx (Replace the x’s with your 10-digit ISBN, do not use spaces or hyphens). Currently, Amazon uses only the 10-digit ISBN in the url (not the 13-digit ISBN). So if you do not have your 10-digit ISBN, you can convert it. To convert, simply browse to the following url, then cut and paste your 13-digit ISBN into the space provided and click on the ‘Convert’ button. If after you’ve used your Authentic Amazon Book url and you notice getting an ‘error’ page or something else that doesn’t look like a typical Amazon Listing, that means the book simply hasn’t been created yet. Once submitted, an Amazon Book Listing (your Book Detail Page), will go ‘LIVE‘ as soon as a couple hours or as late as 3 days later. Just keep using your Authentic Amazon Book url to check if your book is ‘LIVE‘. 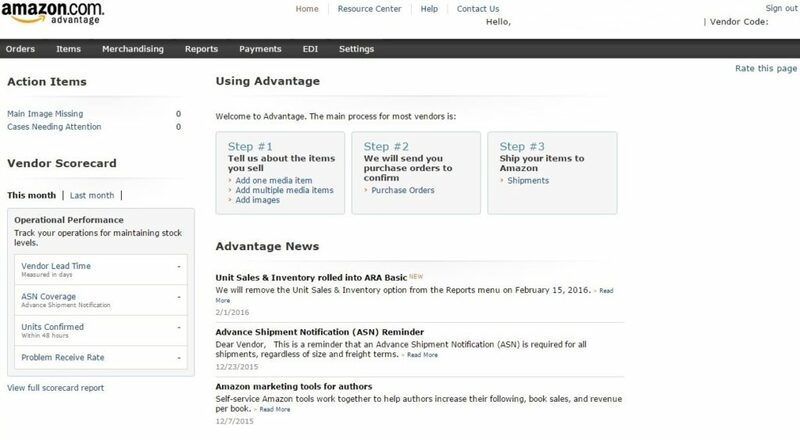 Since Advantage is a consignment program, you’ll be paid for your inventory after it has been purchased and shipped to Amazon customers. Amazon will pay you on a monthly basis (30 days after the end of the month in which the book is sold). “The standard purchase discount is 55% and you keep 45% of the List Price. The standard 55% purchase discount means that Amazon is entitled to a 55% discount on the List Price for each unit that sells. You, the vendor, receive 45% of the List Price. You set the List Price, also known as Suggested Retail Price, of your products, and all payments made to you are calculated based on the List Price. If Amazon decides to further reduce the sales price to the customer below the List Price, the customer discount comes out of Amazon percentage. Once Amazon has your inventory in their fulfillment/warehouse center, it’ll be available for purchase. This means that your book will appear as “In-stock” on its respective Amazon product page, and it will be eligible for Prime(TM) and FREE Super Saver Shipping. 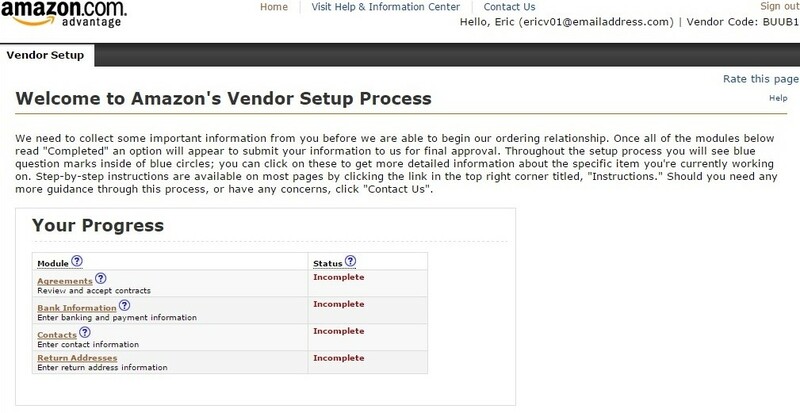 You as the vendor will not pay any extra fees for this feature. If you have any questions or concerns about your account, you can reach Amazon 24 hours a day, 7 days a week through their online “Contact Us” form, which is available at the bottom of every web page in the Advantage account. There is also a Frequently Asked Questions page which you can browse and an online Help system once you’ve created an Advantage account. Professional editing, cover design, interior formatting, etc. Follow the steps above and Amazon Advantage will help you with all the “heavy lifting”.